This archived article was written by: Edmond J. Sanders Jr. This semester I don’t care about your grades. Naturally telling a 14-year-old boy this will have him tangled, especially if you’ve emphasized the importance of academic excellence preceding, but have him exultant as well. Son, I don’t care about your grades, I care about you. I care about you giving your best every time in order to be your best. Understand if you go to class, do all your assignments, study and give it your all and still manage to fail the course, son I’m proud of you because you gave it your all. This was the father, coach and life approach of Larry Gelwix. This attitude was the foundation of his success as a coach and businessman. 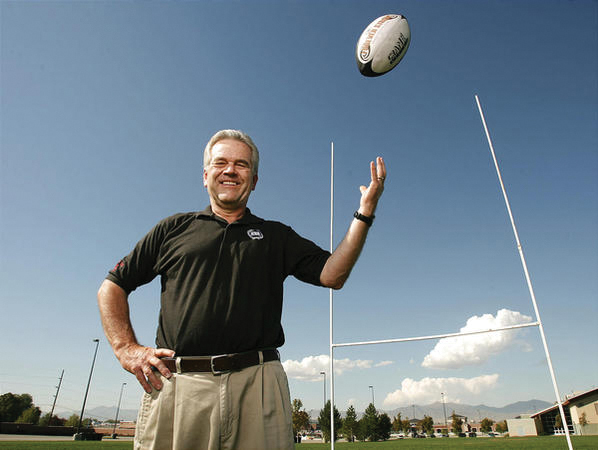 His 418-10 record, including 20-national championships in 36 years of coaching Highland High School rugby, CEO of Columbus travel, as well as 20-plus years as a radio talk show host. Gelwix, a BYU graduate and 3-year varsity rugby alumni earned has a bachelor’s and a master’s degrees in organizational communications. He served as a missionary for the Church of Jesus Christ of Latter-day saints in the Central States missions. Gelwix, has lived a life I envy and many admire; however, he’s a true testament of practice what you preach or he practiced what he now preaches. In 36 years of coaching; having coached more than 3,000-plus athletes in his career, it’s safe to say his legendary career is one that all coaches at all levels of athletic competition desire. But it was his approach to coaching that separates him and his teams from the rest of the nation. The vertical-coaching approach versus the horizontal-coaching approach are idealogies coaches adhere to. The vertical approach is a coach who’s all about winning and is the dictator of the team in his approach. However, Gelwix believes in the horizontal approach. “I can’t win without you, you can’t win without me, so let’s focus on cooperation instead of competition against each other.” His team was a democracy, he believed equality led to success. Good players, good coaches and a good game plan, but eventually you have to move from good to great. In order to be great you have to do your best. If we lose we didn’t play our best; however, if you get beat, that means you did everything you could and just got beat, its honor in that. These are messages that were relayed to a group of young men of the Highland rugby team; however, words of wisdom that can be carried into everyday life by the CEO of a business to middle-school athlete of tomorrow. Gelwix truly believed and proved over 36-plus years of coaching that, “Attitude and effort will carry you on to all your wins in life. It’s what will I do when no one will know what I do, that’s the measure of character. Gelwix lived by a motto of acronyms, W.I.N, What’s Important Now. Expect to win and understand is what you are doing today what you want for tomorrow? Remember to change your attitude you must change your behavior, behavior follows attitude and when life gets tough a champion will just simply put wood on their fire. Be forever strong on the field and you’ll be forever strong off.